NEW ROOF and NEW A/C. 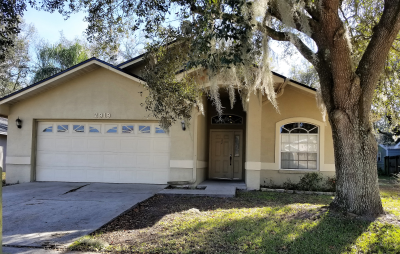 Looking for a 3 bedroom and 2 bath home with 2 car garage, vaulted ceilings and large backyard in Plant City? Look no more because this Wilder Park Subdivision home is close to Plant City Tennis Center, Otis M Andrews Sports Complex and playground. This light and bright interior starts with a foyer with tile flooring, the great room has vaulted ceilings, plant shelves, and opens up into the kitchen featuring a breakfast bar opening with raised panel wood cabinets and solid surface counter tops. The master bedroom has volume ceilings and large windows and master bath is spacious with garden tub, double vanities and large walk in closet. The other 2 bedrooms each have large closets and large windows. There is eat in space off the kitchen with french doors that lead out to the screened in porch that over looks the large backyard. This home needs new carpeting and new interior painting but with a little bit of handy man or a spouse who can do it all, this home is perfect as a starter home or downsizing home. This subdivision has easy commute to I4, Tampa and Lakeland and County Line Road. Inventory is low in this area at this price point and this home won't last long so please call for your private showing. Fence in backyard is getting repaired soon.